» Housing Grand Central Neighborhood Social Services Corp. Though GCNSSC’s primary mission is to provide immediate relief to Midtown Manhattan’s homeless population, it also our aim to help every consumer secure stable housing. Those who are disabled or chronically homeless may have significant barriers to housing stability, and we work closely with them to develop and improve the daily living skills that will help them sustain independent or supported housing. Since different criteria exist for housing programs, our social service staff helps clients find the kind of shelter that they qualify for and the type that will best fit their needs. For some, this means returning to their hometown and reuniting with their families by getting a free ticket through Homeward Bound even if that ticket is for a transoceanic flight. For others, it means looking for rent-subsidized housing that will fit with their income level. For clients struggling with substance abuse and mental illness, a supportive living environment is vital because this type of housing can be a catalyst for long-term change. Our housing coordinator steers clients through the housing application process to find shelter as quickly as possible. We begin working on housing applications right away because it sets up an attainable goal for clients – and this goal fosters a positive attitude and a measure of hope for the future. The “I’m outta here” wall. 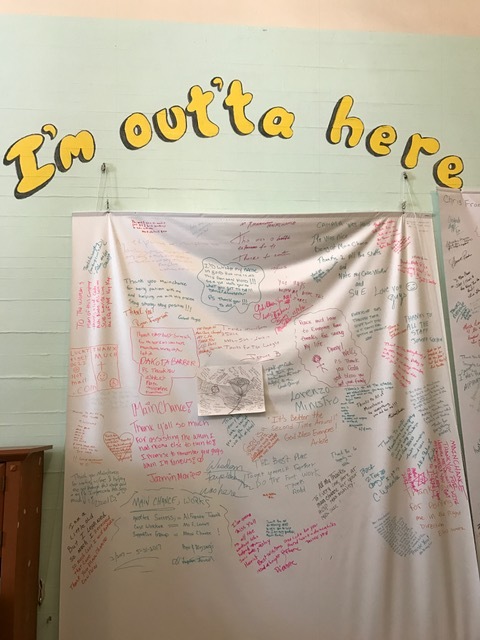 Clients who graduated from the program write notes of appreciation on this wall!